First of all, fat burning is part of day-to-day activities and especially while exercising. Consequently, increasing fat burning results in rapid fat loss. First of all rapid fat loss occurs when fat burning is in full swing. Also, fat burning is essentially oxidation of triglycerides. And, triglycerides are formed by combining glycerol with three fatty acid molecules. Furthermore, the three fatty acid molecules produce energy in the form of adenosine triphosphate. Most noteworthy, triglycerides make up fat cells. Also, the fat cells are located in the adipose tissue, commonly known as body fat. Especially relevant, the adipose tissue’s role is to store fat. And, the adipose tissue is all over the body, including under the skin and wrapped around internal organs. Most of all, during exercise, the body needs energy. Also, initially it gets it from glucose in the blood. And, then, the body gets energy from the triglycerides in the fat cells. Furthermore, triglycerides oxidized by oxygen deliver energy. And, the triglycerides get this oxygen from the blood stream Also, oxidation releases three fatty acids, which are energy sources. First of all, the lungs inhale oxygen. Then the oxygen is transferred to red blood cells in the blood stream. And, the oxygen rich red blood cells deliver oxygen to the triglycerides. Furthermore, the by-product of triglyceride oxidation is carbon dioxide and water. Consequently, the carbon dioxide and water enter the blood stream. Then, the carbon dioxide leaves the blood stream and enter the lungs. And the lungs exhale the carbon dioxide. Finally, the water in the blood stream leaves the body through the kidneys, intestines and skin pores (as sweat). Most noteworthy, researchers from the University of New South Wales in Australia found that when weight is lost the majority of it leaves the body as carbon dioxide. In addition, they found that oxidation of 22 pounds of human fat needs 64 pounds of oxygen. And the lungs inhale this oxygen. Consequently, oxidation produces 62 pounds of carbon dioxide and 24 pounds of water. Furthermore, the infographic below illustrates the process. Most noteworthy, the infographic illustrates amount of fat burned by 50 year old, 5’ 8” male and female joggers in one hour. In conclusion, faster oxidation causes rapid fat loss. And this occurs when you inhale deeply and rapidly. Finally, this occurs when you are doing aerobic exercises such as jogging, running, swimming, cycling, elliptical trainers, etc. 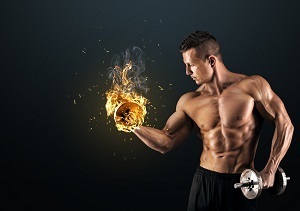 Click here to visualize the fat burning process in your body.